Wolfgang Mittermeyer is a rear admiral serving in Reinhard’s fleet and, along with Oskar von Reuenthal, Reinhard’s ablest field commander. Mittermeyer is a commoner, born to a middle-class family. 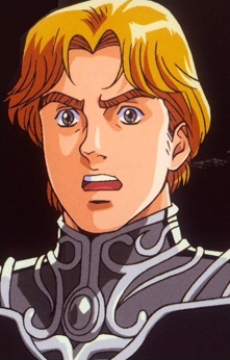 He first met Reuenthal while stationed in fortress Iserlohn, early in his career, and the two became close friends. Kind and caring, Mittermeyer has been a stabilizing factor for Reuenthal’s self-destructive tendencies ever since. A family man at heart Mittermeyer soon married his childhood sweetheart Evangeline and became a dedicated husband, but their efforts to have children have been fruitless thus far. Unfortunately for him, his lowly pedigree was about to cause him serious trouble. Mittermeyer ordered the execution of one of his subordinates for assaulting, robbing and murdering a civilian woman. Although his decision was just, he turned out to belong to a powerful noble family and Mittermeyer was soon arrested. While the nobles plotted his death, desperate to save his only friend Reuenthal met with Reinhard von Müsel (later Lohengramm) and offered his and Mittermeyer’s loyalty to him, in exchange for aid in saving Mittermeyer from the nobility and clearing his name. Reinhard, who had his own well-known issues with the nobles, readily accepted and both of them were transferred under his command. Nicknamed “the gale wolf”, Mittermeyer is renowned for his boldness in warfare, his lightning responses to changing factors in the battlefield, as well as his ability to cover huge distances in a relatively short time, while keeping his fleet organized from his flagship Beowulf. Under Reinhard's command, he receives the flagship Beowulf. Mittermeyer is an able strategist and a brilliant tactician, one of the very best of his era. He is composed, just with his subordinates and fiercely loyal to Reinhard, not only for saving his life, but also because he honestly respects his abilities.